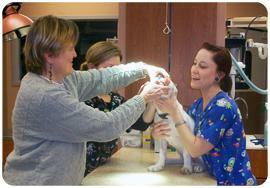 Complete examinations on dogs, cats, birds, pocket pets and pet pigs. October 24, 2012 is a date I won’t soon forget as it is the day my Golden Retriever, Jack, died. I also won’t forget the expert treatment he received that morning at C.V.H. From the moment he was scooped out of my vehicle, to the research effort and communication with Poison Control, to everyone’s compassion – we were both in good hands. I don’t doubt for a second he knew he was among people who really cared.